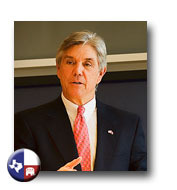 Roger Williams is running to represent Texas in the U.S. Senate. Roger Williams was sworn in as Texas’ 105th Secretary of State on February 8, 2005. As Chief Election Officer for Texas, Secretary Williams worked to ensure the uniform application and interpretation of election laws throughout the state. The Secretary worked tirelessly to promote economic development, investment and job creation in Texas. He also served as the state’s Chief Liaison for Texas Border and Mexican Affairs as well as Chair of the state’s 2005 Base Realignment and Closure Response Strike Force. Rogers’ passion for principled, conservative leadership has led him to assist the political efforts of Republican candidates from the White House to the county courthouse. He served as Regional Finance Chairman for Governor Bush in 1994 and 1998 before he went on to later serve as the North Texas Chairman for the Bush/Cheney 2000 campaign as well as the North Texas Finance Chairman and National Grassroots Fundraising Chairman for Bush/Cheney ’04, Inc. Williams was appointed by President George W. Bush in 2001 as the Chairman of the Republican National Finance Committee’s Eagles Program. He has also served as State Finance Chair for John Cornyn for U.S. Senate, Inc., in 2002 and as the National Director of the “Patriots” program for Senator Cornyn. Roger Williams’ civic activities include serving on the Board of Trustees for the Bush School of Government and Public Service at Texas A&M University. Williams is also a member of the Texas Christian University Board of Trustees, his alma mater. He also serves on the National Football Foundation and College Football Hall of Fame Board of Directors as well as serving on the Admiral Nimitz Foundation Board of Directors in Fredericksburg, Texas. Roger has been a small business owner in Fort Worth and Weatherford, Texas for 37 years. He and his wife, Patty, currently reside in Weatherford and have two daughters. "One size fits all government solutions never work and they are hurting our children's education. We must re-emphasize local control of schools at the Pre-K through 12 level. Parents and teachers know best when it comes to providing for educational needs - not government bureaucrats." You can follow Roger Williams on Facebook and on Twitter.